Will Match All Major Lock Manufactures Thru Bolt Locations. - Turn/Push button locking. Pushing and turning button locks outside lever requiring use of key until button is manually unlocked. 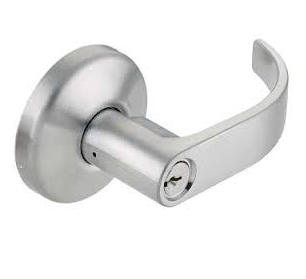 Pushing button locks outside lever until unlocked with key or inside lever is turned. 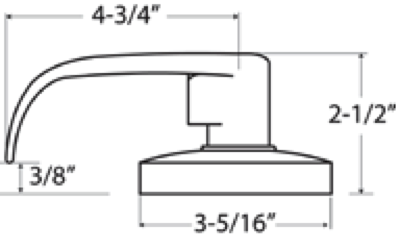 - Full length 4-3/4" lever handle. Rose diameter 3-1/2". Key removable outside lever for fast rekeying. Non-handed levers. Concealed mounting screws. - 1 3/8" to 1 3/4" thickness. - 2 3/4" Standard, 2 3/8", 3 3/4" and 5" optional. -Cold Rolled Steel and Zinc Dichromate finish for rust resistance with precision cast steel retractor. 2 1/8" diameter bore. -ASA 1 1/4" x 4 7/8" standard. Other strikes available upon request. 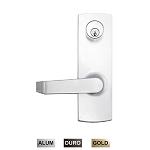 - Wrought brass, bronze or stainless steel, levers are Zinc casting, plated to match trim finish. - Meets or exceeds requirements of BHMA/ANSI A156.2 Series 4000, Grade 2 (FF-H 106C), 400,000 cycles. - 2 3/4" standard, brass with 1/2" throw. 2 3/8", 3 3/4" and 5" backset optional. GND750 deadlatch reversible for flat and beveled door. 3/4" throw anti-friction deadlatch for pair of fire doors. 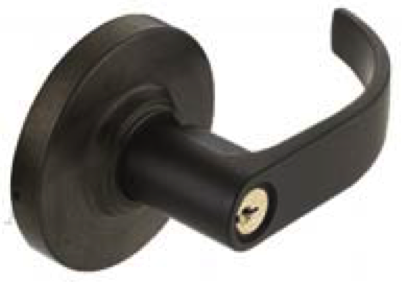 -2 1/4" x 1 1/8" adjustable for flat or beveled doors 1/8" in 2", for 2 3/4" backset. Optional 2 1/4" x 1" for 2 3/8" backset.